Your spring maintenance checklist should include five essential outdoor projects. Left unattended, they can end up costing you dearly in more serious repairs that could require remediation by professional contractors. This scenario should add urgency to any list, but there can be light at the end of the proverbial tunnel. After you're finished inspecting your windows, reward your efforts with new exterior solar shades from America's leading shade manufacturer – and save this list for easy reference next year. Clean your air conditioner. Dirt, debris and grime undermine the efficiency of your air conditioner, causing it to run longer, which will cost you money you don't have to spend every month. Turn off the electricity, open the unit and remove grass clippings and leaves accumulated inside. Vacuum the fins with a soft-bristled attachment before rinsing them with a gentle stream of water. When you go back inside to restore the power, replace the filter to enhance the efficiency of your air conditioner. Repair patches of rotted wood. Stem the location of rotting wood by using a sharp tool – a screwdriver will do – to remove the rotted wood, often found around windows. Press a polyester filler into the recessed area with a putty knife, alternately patting down the filler and adding more until you've recreated the shape of the original wood. Wait for the filler to dry and harden before painting. Clean your gutters. This is a two-person job, even if the “wingman” does nothing more than steady the ladder. (This points up a useful precaution about never climbing a ladder unattended.) 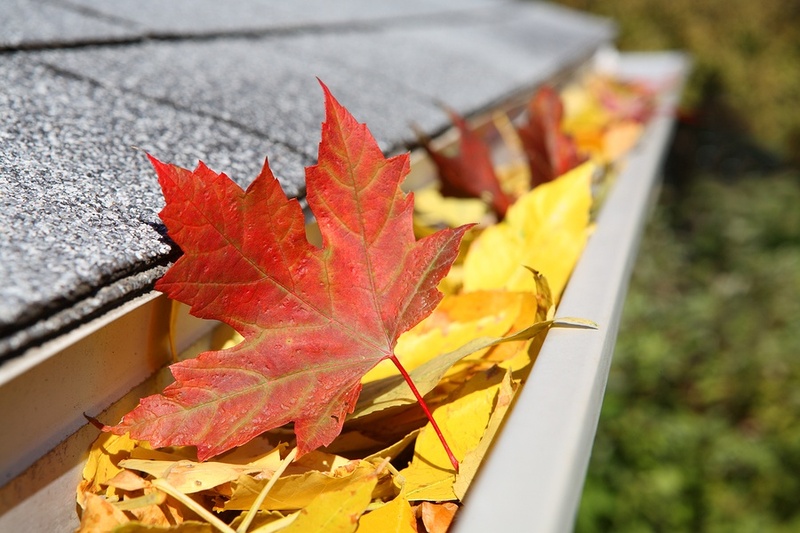 Grab as many leaves, twigs and branches from the gutters before flushing them with water. Checking for proper drainage will ensure water doesn't accumulate and enter your home, potentially causing extensive water and electrical damage. Inspect your roof. As long as you're up on a ladder, check the condition of your roof. Look for signs of impending trouble in nail pops, broken or curled shingles and missing or damaged flashings. Roof repairs are better suited to the professionals who know how to safely navigate the terrain of a roof. Consider yourself fortunate you've identified – and can repair – problems before they, too, lead to leaks and water damage. Replace deteriorating caulk or weather stripping around your windows. A tight seal will prevent cool air from seeping out of your home as well as warm air from drifting in. Use weather stripping around movable components and caulk to fill cracks and gaps. Take the extra step to insulate your windows by ordering exterior solar shades from Polar Shades – the premier manufacturer of interior and exterior shades. These shades can block up to 98 percent of the solar heat rays from the sun while providing 100 percent shade. Polar Shades can cool you off and cool off your energy bills – as soon as you finish your list and schedule a free in-home consultation by calling 702-260-6110 today.